Pink Bunkadoo: Downloadables are so versatile, really! Downloadables are so versatile, really! III (yep, that's what we call him) convinced me after much badgering that having images that you can download for unlimited use with a small price was a good idea. I humored him, because he always thinks so creatively. Then as I watched the images go up in the store, they fired my imagination. I just had to get my hands on them. What I learned is that you can think of downloads like a digital stamp. Unlike a traditional stamp (which I am still a huge fan of) you can change the size, sentiment and color. Now I am a big fan of downloadable, too and have many more projects in mind. I'll put some on my Instagram account pinkbunkadoo. The very first download project was this sympathy card. I downloaded the English Ivy and Boston Fern Vintage Downloadable and added the simple sentiment. I ran it through my Minc Machine with some gold foil. I suppose we need to stop right here and discuss the fact that I am not at all a green thumb or knowledgeable about plants in any way. I can not be trusted with even the most easy to grow plants. Furry things I am great at. Anyways if you are a plant expert and our downloadable names make you crazy, please feel free to correct them in the comment section. Back to the first card. I loved it. I loved the foil, the turquoise paper and the kraft card. And I knew I had to make more. If you are a Mac user and proficient in InDesign, I won't bore you with the next step. However, if you are a PC user and familiar with Word these instructions are for you. 1. In your Word document, insert a text box. 2. From your Downloads folder, copy and paste the image you want to use. 3. Insert a second text box inside the text box with your image. 4. Type your sentiment in the small text box. 5. Using Control A to select all, your can copy and paste it three more times. 6. Change your sentiment if you wish. 7. Print on card stock. 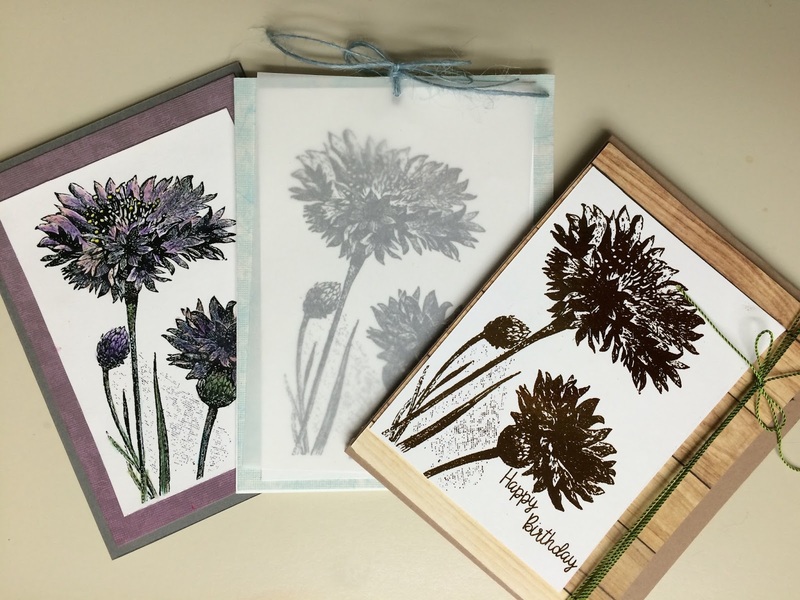 For this card, I used the Bachelor Button Downloadable. The first card came out so well, I had to foil this card, too. I used some bronze foil this time. 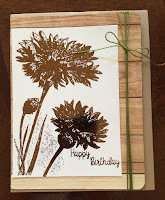 Digging in my scrap paper box and feeling virtuous I found some wood plank paper and glued the foiled flower to it. I put the card panel on my favorite Neenah Kraft Cover and tied the whole package with some pretty green twine. I can't decide if it's a fall card or a masculine card. What do you think? My next card couldn't be any simpler. I adhered my Bachelor Button to some light blue paper and overlay some vellum on top. Using my Crocodile, I punched through all three layers and tied it with blue twine. 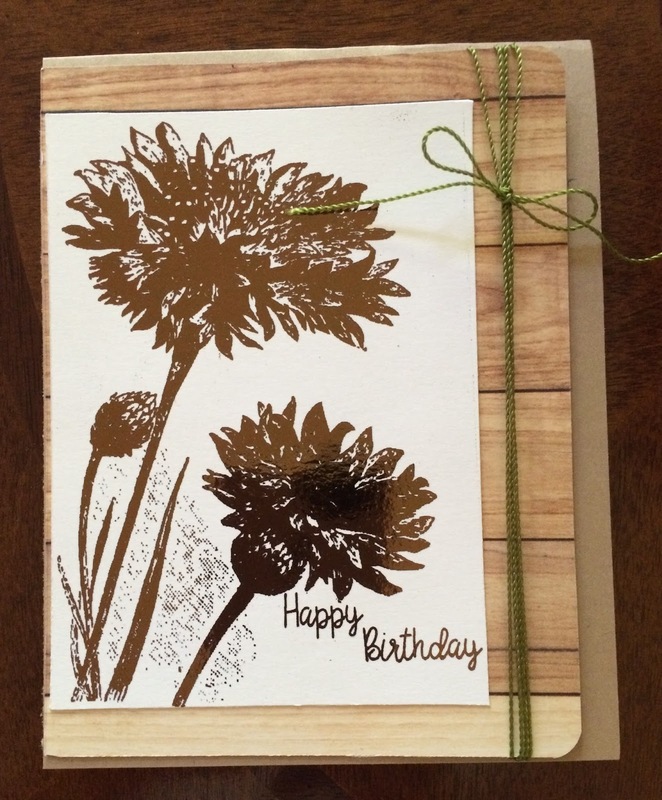 It is a quick, easy, and elegant card. My last card I colored with colored pencils and back it with some purple paper. And my three cards were done. Wait a second! Didn't I print out four images? Yes, and I flubbed the last one on the finished line. I think the technique is still good and I'll try it again. And of course, I'll share it with you. All materials either come from my Etsy Store Pink Bunkadoo or are Amazon affiliate links where I buy most of my supplies.